Our staff at Medifocus is committed to keeping our subscribers to the Medifocus Digest Alert on Multiple Myeloma abreast of the latest new research developments that have recently been published in the medical literature for this condition. In this issue of the Digest Alert, you will find a focused list of hand-picked journal article references that represent the latest advances in basic and clinical research for Multiple Myeloma. These articles represent the current state-of-the-art of the research that will hopefully lead to additional major advances and breakthroughs in the clinical management of Multiple Myeloma. You can access the summaries of each article referenced below by simply clicking on the article Title. We will continue to update you with the latest scientific and clinical developments through the Medifocus Digest Alert on Multiple Myeloma every 3 months. Thank you for your ongoing subscription to this publication. 1: The risk of infections in multiple myeloma before and after the advent of novel agents: a 12-year survey. Institution: Klinik fur Innere Medizin II, Abt. Hamatologie und Internistische Onkologie, Universitatsklinikum Jena, Jena, Germany. marie.von_lilienfeld-toal@med.uni-jena.de. ; Research Program 'Else Kroner-Forschungskolleg AntiAge', Universitatsklinikum Jena, Jena, Germany. ; HELIOS Klinikum, 4. Medizinische Klinik, Abt. Hamatologie und internistische Onkologie, Hamostaseologie, Erfurt, Germany. ; Integriertes Forschungs-und Behandlungszentrum (IFB) Sepsis und Sepsisfolgen, Center for Sepsis Control and Care (CSCC), Universitatsklinikum Jena, Jena, Germany. ; Institut fur Medizinische Statistik, Informatik und Datenwissenschaften, Universitatsklinikum Jena, Jena, Germany. Journal: Ann Hematol. 2019 Mar;98(3):713-722. doi: 10.1007/s00277-019-03621-1. Epub 2019 Jan 24. 2: Study of the frequency and reasons for discontinuation of different lines of treatment in patients with multiple myeloma. Institution: Hematology Department, Hospital del Mar-IMIM (Institut Hospital del Mar d'Investigacions Mediques), Universidad Autonoma de Barcelona, Barcelona, Spain. 60014@parcdesalutmar.cat. Journal: Ann Hematol. 2019 Mar;98(3):705-711. doi: 10.1007/s00277-019-03601-5. Epub 2019 Jan 23. 3: Discovery of a novel dipeptidyl boronic acid proteasome inhibitor for the treatment of multiple myeloma and triple-negative breast cancer. Institution: College of Science, Nanjing Forestry University, No. 159 Longpan Road, Nanjing 210037, PR China. hk-lm@163.com. Journal: Org Biomol Chem. 2019 Jan 16;17(3):683-691. doi: 10.1039/c8ob02668h. 4: Discovery of Mcl-1-specific inhibitor AZD5991 and preclinical activity in multiple myeloma and acute myeloid leukemia. Institution: Oncology, IMED Biotech Unit, AstraZeneca, Waltham, MA, 02451, USA. Medicine, Atlanta, GA, 30322, USA. Journal: Nat Commun. 2018 Dec 17;9(1):5341. doi: 10.1038/s41467-018-07551-w.
5: Case-based roundtable on treatment approach for young, fit, newly diagnosed multiple myeloma patients. Institution: Division of Hematologic Oncology, Memorial Sloan Kettering Cancer Center, New York, NY; and. Journal: Hematology Am Soc Hematol Educ Program. 2018 Nov 30;2018(1):103-109. doi: 10.1182/asheducation-2018.1.103. 6: Approach to the treatment of the older, unfit patient with myeloma from diagnosis to relapse: perspectives of a US hematologist and a geriatric hematologist. Institution: Division of Medical Oncology, Washington University School of Medicine, St. Louis, MO; and. Medical Oncology, Dana-Farber Cancer Institute, Harvard Medical School, Boston, MA. Journal: Hematology Am Soc Hematol Educ Program. 2018 Nov 30;2018(1):88-96. doi: 10.1182/asheducation-2018.1.88. 7: Bortezomib, lenalidomide, and dexamethasone with panobinostat for front-line treatment of patients with multiple myeloma who are eligible for transplantation: a phase 1 trial. Institution: Department of Lymphoma/Myeloma, The University of Texas MD Anderson Cancer Center, Houston, TX, USA. Electronic address: eemanasanch@mdanderson.org. Center, Houston, TX, USA. Center, Houston, TX, USA. Center, Houston, TX, USA. MD Anderson Cancer Center, Houston, TX, USA. Houston, TX, USA. Center, Houston, TX, USA. Houston, TX, USA. Center, Houston, TX, USA; Department of Experimental Therapeutics, The University of Texas MD Anderson Cancer Center, Houston, TX, USA. Journal: Lancet Haematol. 2018 Dec;5(12):e628-e640. doi: 10.1016/S2352-3026(18)30174-1. 8: Navigating the treatment landscape in multiple myeloma: which combinations to use and when? Institution: Internal Medicine V and National Center for Tumor Diseases (NCT), University Clinic Heidelberg, 69120, Heidelberg, Germany. hartmut.goldschmidt@med.uni-heidelberg.de. France. cellulaire, Sorbonne Universite, Paris 6, Paris, France. Journal: Ann Hematol. 2019 Jan;98(1):1-18. doi: 10.1007/s00277-018-3546-8. Epub 2018 Nov 23. 9: Continuous therapy in standard- and high-risk newly-diagnosed multiple myeloma: A pooled analysis of 2 phase III trials. Institution: Myeloma Unit, Division of Hematology, University of Torino, Azienda Ospedaliero-Universitaria Citta della Salute e della Scienza di Torino, Torino, Italy. Electronic address: fgay@cittadellasalute.to.it. ; AOU Maggiore della Carita Novara, Universita del Piemonte Orientale, Novara, Italy. ; Divisione di Ematologia, AOU Policlinico-OVE, Catania, Italy. ; Clinica di Ematologia, AOU Ospedali Riuniti di Ancona, Ancona, Italy. ; University of Bari 'Aldo Moro' Medical School, Department of Biomedical Science, Internal Medicine 'G. Baccelli' Policlinico, Bari, Italy. Journal: Crit Rev Oncol Hematol. 2018 Dec;132:9-16. doi: 10.1016/j.critrevonc.2018.09.008. Epub 2018 Sep 14. 10: Immunotherapy: A Novel Era of Promising Treatments for Multiple Myeloma. Institution: Department of Hematology, Hospital Clinic, IDIBAPS, 08036 Barcelona, Spain. mcastella@clinic.cat. cfernan1@clinic.cat. Journal: Int J Mol Sci. 2018 Nov 15;19(11). pii: ijms19113613. doi: 10.3390/ijms19113613. 11: Ixazomib for the treatment of multiple myeloma. Institution: a Division of Hematologic Malignancy, Jerome Lipper Multiple Myeloma Center , Dana-Farber Cancer Institute , Boston , MA , USA. Amsterdam , Amsterdam , The Netherlands. MA , USA. Dana-Farber Cancer Institute , Boston , MA , USA. MA , USA. Institute, Atrium Health , Charlotte , NC , USA. USA. USA. Journal: Expert Opin Pharmacother. 2018 Dec;19(17):1949-1968. doi: 10.1080/14656566.2018.1528229. Epub 2018 Nov 13. 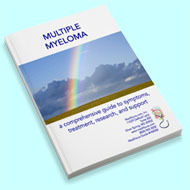 12: Elotuzumab plus Pomalidomide and Dexamethasone for Multiple Myeloma. Institution: From the National and Kapodistrian University of Athens, Athens (M.A.D. ); Karol Marcinkowski University of Medical Sciences, Poznan (D.D. ), and Silesian Medical University, Katowice (S.G.) - both in Poland; University Hospital, Nantes (P.M.), and Centre Hospitalier Universitaire de Poitiers-La Miletrie, Poitiers (X.L.) - both in France; National Hospital Organization Disaster Medical Center (N.T.) and the Japanese Red Cross Medical Center (K.S. ), Tokyo, and Ibaraki Prefectural Central Hospital, Kasama (M.H.) - all in Japan; Hopital Maisonneuve-Rosemont, University of Montreal, Montreal (R.L. ); Heidelberg University Hospital, Heidelberg, Germany (M.S.R. ); Dana-Farber Cancer Institute, Boston (P.G.R. ); Bristol-Myers Squibb, Princeton, NJ (M.P.M., Y.-M.J., S.G.S., M.R., B.R. ); and Clinica Universidad de Navarra, Centro de Investigacion Medica Aplicada, Instituto de Investigacion Sanitaria de Navarra (IDISNA), Centro de Investigacion Biomedica en Red de Cancer (CIBERONC), Pamplona, Spain (J.S.-M.). Journal: N Engl J Med. 2018 Nov 8;379(19):1811-1822. doi: 10.1056/NEJMoa1805762. 13: Real-life data on safety and efficacy of autologous stem cell transplantation in elderly patients with multiple myeloma. Institution: Centro Hospitalar de Sao Joao, Porto, Portugal. carolinamarini@gmail.com. Journal: Ann Hematol. 2019 Feb;98(2):369-379. doi: 10.1007/s00277-018-3528-x. Epub 2018 Oct 27. 14: Therapeutic antibodies for multiple myeloma. Institution: Department of Hematology, Japanese Red Cross Medical Center, Tokyo, Japan. Journal: Jpn J Clin Oncol. 2018 Nov 1;48(11):957-963. doi: 10.1093/jjco/hyy133. 15: Drug resistance in multiple myeloma. Institution: Department of Experimental Hematology, Medical University of Lodz, Lodz, Poland. address: robaktad@csk.umed.lodz.pl. Journal: Cancer Treat Rev. 2018 Nov;70:199-208. doi: 10.1016/j.ctrv.2018.09.001. Epub 2018 Sep 4. 16: Irreversible proteasome inhibition with carfilzomib as first line therapy in patients with newly diagnosed multiple myeloma: Early in vivo cardiovascular effects. Institution: Cardiology Unit, Department of Medical and Surgical Specialties, Radiological Sciences and Public Health University, Cardiothoracic Department, Spedali Civili of Brescia, Italy. Electronic address: gavazzonimara@gmail.com. ; Department of Hematology, Spedali Civili of Brescia, Brescia, Italy. Journal: Eur J Pharmacol. 2018 Nov 5;838:85-90. doi: 10.1016/j.ejphar.2018.09.014. Epub 2018 Sep 7. 17: Impact of elotuzumab treatment on pain and health-related quality of life in patients with relapsed or refractory multiple myeloma: results from the ELOQUENT-2 study. Institution: Northwestern University, Chicago, IL, USA. jmckendrick@prmaconsulting.com. Journal: Ann Hematol. 2018 Dec;97(12):2455-2463. doi: 10.1007/s00277-018-3469-4. Epub 2018 Sep 4. 18: Clinical significance of cancer-related fatigue in multiple myeloma patients. Institution: Department of Clinical Oncology/Hematology, The Jikei University School of Medicine, 3-25-8 Nishi-Shinbashi, Minato-ku, Tokyo, 105-8461, Japan. kaz-suzuki@jikei.ac.jp. ; Department of Virology, The Jikei University School of Medicine, Tokyo, Japan. ; Central Clinical Laboratory, The Jikei University Hospital, Tokyo, Japan. ; Department of Public Health and Enviromental Medicine, The Jikei University School of Medicine, Tokyo, Japan. Journal: Int J Hematol. 2018 Dec;108(6):580-587. doi: 10.1007/s12185-018-2516-1. Epub 2018 Aug 28. 19: Daratumumab and its use in the treatment of relapsed and/or refractory multiple myeloma. Institution: Winship Cancer Institute, Emory University, Atlanta, GA, 30322, USA. Journal: Future Oncol. 2018 Dec;14(30):3111-3121. doi: 10.2217/fon-2018-0275. Epub 2018 Aug 23. 20: Frontline treatment for transplant-eligible multiple myeloma: A 6474 patients network meta-analysis. Institution: Post-graduation Program in Epidemiology-Universidade Federal do Rio Grande do Sul, Porto Alegre, Brazil. Sul, Porto Alegre, Brazil. Sul, Porto Alegre, Brazil. Journal: Hematol Oncol. 2019 Feb;37(1):62-74. doi: 10.1002/hon.2552. Epub 2018 Sep 20. 21: The role of carfilzomib in treatment of newly diagnosed multiple myeloma. Institution: Department of Internal Medicine II, Division of Hematology & Medical Oncology, Wuerzburg University Medical Center, Wuerzburg, Germany. Wuerzburg University Medical Center, Wuerzburg, Germany. Journal: Future Oncol. 2018 Dec;14(30):3123-3134. doi: 10.2217/fon-2018-0040. Epub 2018 Jul 30.